Only service dogs are permitted to enter the farm. Please leave your pets at home. Details can be found on our FAQ page. We are proud to offer a 10% military discount on admission at the gate with valid identification. Military, veterans, first responders, teachers, healthcare workers, and grandparents; check out our Special Events page for special weekend discounts. Admission includes access to the Corn Maze, Field of Fun, and Hayrides. All prices subject to HST. We accept Visa, MasterCard, Debit, and Cash. Admission includes access to the Corn Maze ONLY. 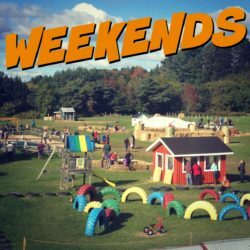 The Field of Fun and Hayrides are closed during the week, except for group booking.